Mule deer hunting in Idaho’s backcountry units is a very exciting hunt. It will test your patience and resolve as you will probably get the chance to look over several deer and decide what your idea of a “trophy muley” is. Mule deer hunting is unlike any other type of western big game hunting I am aware of. They don’t run screaming through the woods like a lovesick bull elk saying “here I am”, they don’t howl their delight with their latest kill or in searching for a mate like a wolf or coyote, you can’t entice them in with a barrel full of sweet smelling and tasty day old donuts like the always hungry Idaho black bear. No these ghosts of the woods require getting up to a high point and judicious use of high quality optics. One can spend hours glassing a hillside absolutely convinced you could almost name every tree and bush on that cross canyon hillside and you know and you know that you know that nothing alive is on yonder hill…and then you see it, the flicker of an ear, a white spot that wasn’t there the last twenty times you looked. Are those antlers or branches? Your heart skips a beat and you know the hunt is on. This is mule deer hunting in the West at its best and that is what makes it such a challenge. Now field judging and figuring out how to close the distance so you can make a clean 1 shot kill on that trophy Idaho Mule deer begins and planning with your guide is critical. You need to make the right moves to be able to position yourself for a clean shot. Your Idaho mule deer hunt will begin at our comfortable base camp where your “room” for the week will consist of wall tents, cots with foam pads and a wood burning stove to thwart the nights chill. Our early season mule deer hunts take place from a drive in base camp on a Wilderness Road corridor which means each side of this road is wilderness and requires foot travel from the moment you step out of the truck until you return. We will drive out each day to a spot that historically has held good numbers of mule deer bucks and we will begin glassing country for as far as you can see. You might want to only glass as close as you want to walk because some of this country can get steep and deep. Our late season mule deer hunts start form a drive in camp too, but then all access after that is done on horseback or hiking. Trucks generally don’t leave the camp as we are on the edge of the wilderness and travel into a Roadless expanse daily to hunt. Sometimes for the very adventurous we will “spike out” and hunt and carry our camp on our back or our trusty mule. These more “extreme” type hunts are not for the faint of heart or the guy looking for a 5 star meal. This evening you “spike out”, canned stew and PB&J might be the breakfast, lunch and dinner, but the reward may come in some vast unspoiled backcountry adventure far away from men and machines and culminate in a mule deer trophy of a lifetime. 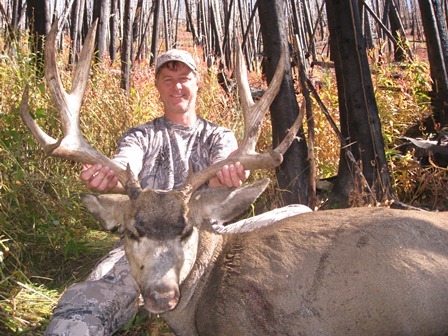 An Idaho Mule Deer hunt can be a stand-alone hunt or one of many animals you are able to pursue with our Idaho combo hunt see our pricing page, to help you decide if it is just an Idaho mule deer hunt you want or you want to up your odds with a combo hunt. 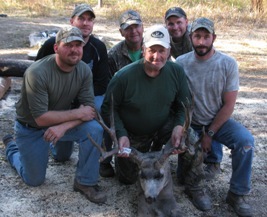 We do hope you will join us on an Idaho mule deer hunt. Give us a call or send us an email to find out about available spaces. Remember also any hunts we do guided we also offer for the DIY hunter in the form of drop camps. Contact us today and let’s get you lined out on your backcountry Idaho deer hunt. Bring your friends and kids.